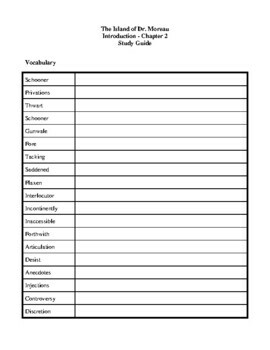 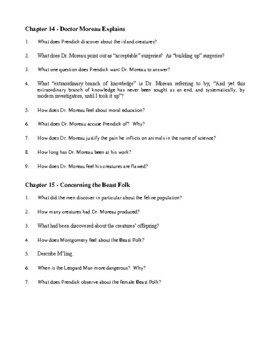 The Island of Dr. Moreau Study Guide contains vocabulary and questions arranged according to grouped chapters of the novel (Introduction-2, 3-5, 6-8, 9-11, 12-13, 14-15, 16-18, 19-20, 21-Afterward). 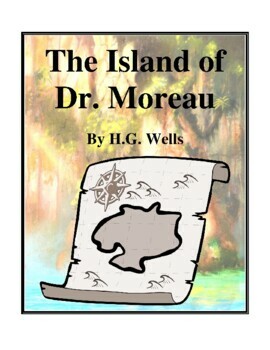 Also included are the following titles: Character Identification and Analysis, Abecedary Chart, Book Cover, Schooner Parts, Theme Analysis, All in the Head, Character Survival Kit, Warning Sign, Questions for Dr. Moreau, Cluster Web, Different Perspectives, Using One's Senses, One of a Kind, Comic Book Page, Genetic Mutation Breakthrough, Rules to Live By, Motive, Conflict, Flowchart, Island Map, Knowing Yourself through Poetry, Trading Card, Headline News, Leveled Questions. 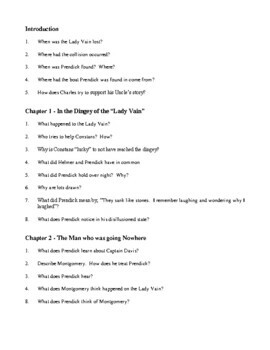 Sorry, but an Answer Key has not been developed for this resource.